Whether you need to consolidate private or federal school loans, this guide walks you through student loan debt consolidation so you can find relief. Consolidation refers to the process of rolling multiple debts into a single, simplified repayment schedule. In this case, you combine your school loans into one or more repayment plans that work for your budget. There are several ways to consolidate student debt, depending on the types of loans you have, your budget and your credit. For the purposes of consolidation, it doesn’t matter if you have subsidized or unsubsidized loans; both consolidate in the same way. However, if you use federal loan consolidation options, those only apply to your government-backed debt. In other words, you can use federal consolidation and repayment plans for private student loans. By contrast, if you consolidate through a private (for profit) lender, you can include both your private and federal school loans. Just be aware that if you use private consolidation for your federal loans, you lose eligibility for federal relief programs. You can’t use government offered repayment plans or loan forgiveness. You need to consider your options and situation carefully before you covert federal debt to private. 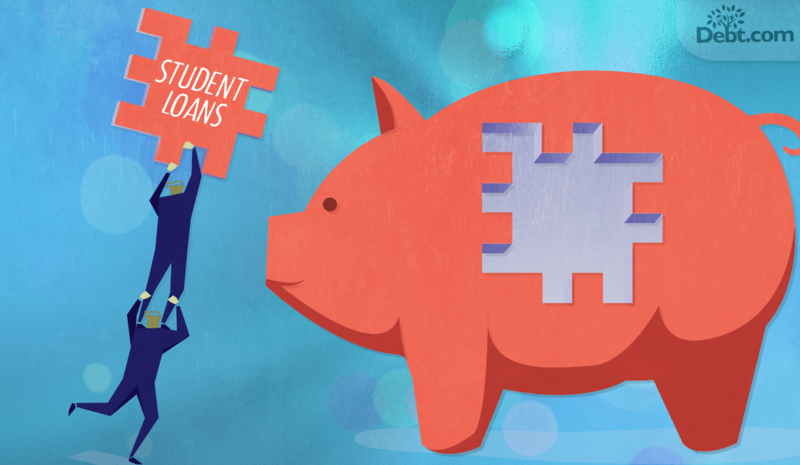 Consolidating federal student loan debt is a two-part process. First you consolidate all your eligible federal loans using a Direct Consolidation Loan; this rolls your debts into a single monthly payment. Note: If you have older loans under the FFEL program, then you use an FFEL consolidation loan instead. Next, you enroll in a federal repayment plan. This helps you establish a payment schedule that works for your budget and debt elimination goals. In most cases, you want to choose a hardship-based repayment plan, such as Income-Based Repayment. If you work in public service as a teacher, nurse, or first responder, using this method of consolidation ensure you are eligible for Public Service Loan Forgiveness. A private student debt consolidation loan works in much the same way as a credit card debt consolidation loan. You apply for a consolidation loan through a private lender and qualify based on your credit score. You choose a term that gives you monthly payments that work for your budget. A longer term means lower monthly payments but higher total costs. A shorter term increases monthly payments but minimizes total interest charges. The interest rate on the new loan depends on your credit rating. Once approved, the lender disburses the funds to pay off the existing loans you consolidated. If you have private student loans to repay, private consolidation can be extremely beneficial. You can simplify your bill payment schedule and (if you have good credit) lower the interest rate on your debt. The main question is whether you should include federal loans in with a private consolidation plan. Below are some pros and cons of using private school loan consolidation for federal loans. There are more benefits than risks by count, but the downsides carry significant weight. Consider your options carefully! When you consolidate through a federal program, you don’t get a lot of choices. The interest rate on the repayment plan is a weighted average of the rates on your existing loans. Whether you have good credit or bad credit, it doesn’t matter; your credit score plays no role in determining your rate. The term (length of your loan) depends on the repayment plan. Terms range from 10 years up to 30 years, depending on the repayment plan you choose. Most hardship-based repayment plans have 25-year terms. Going through a private lender means you can choose your term and get a rate based on your credit score. An excellent credit score can be a good reason to go private. If you split your consolidation plan into two parts, you have to remember to cover both bill payments. Although two bills are probably much easier than paying your loans individually, it’s still not as simple as one payment. Federal student loan servicers aren’t always known to provide the best service to borrowers. In fact, a recent report in Forbes revealed over half of the CFPB student loan complaints (54%) relate to federal servicing. That’s not to say private loan servicers don’t have customer service issues. However, with private servicing, you can choose your lender based on research like customer service reviews. You usually don’t get that luxury with federal programs. So, for example, you might want to avoid Navient because they account for almost one quarter CFPB complaints and face a CFPB lawsuit. However, if your repayment gets assigned to Navient, there’s little you can do to change servicers. Once you qualify for a private consolidation loan, you’re set. You have the same fixed payments to cover unless you choose to refinance down the road. On the other hand, if you consolidate federal loans and use a hardship-based repayment plan, you must recertify annually. Basically, you must recertify that you qualify for hardship based on your Adjusted Gross Income and family size. Annual recertification can be a pain, especially if your loan servicer doesn’t remind you. If you don’t recertify, you can get dropped from the program. So, you have to know when your recertification date is and be proactive about applying each year. If you work in public service, there’s good reason to avoid private consolidation. Any debts you convert from federal to private will never qualify for loan forgiveness. You must use a hardship-based federal repayment plan and make payments for 10 years to qualify for PSLF. Private consolidation loans don’t care about your financial state. Monthly payments depend on the term you choose. The only way to lower your payments would be to modify your consolidation loan to extend the term. Even if you have steady income and can afford the payments now, there’s a risk that your situation can change. If you lose your job or run into trouble, there’s no going back to use federal hardship-based repayment plans. Article last modified on April 12, 2019. Published by Debt.com, LLC .